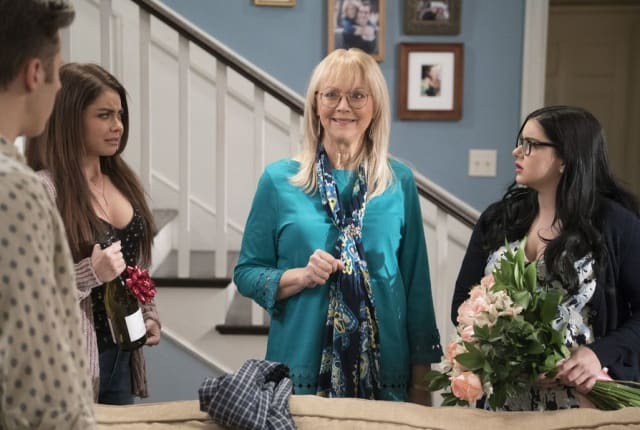 Watch Modern Family Season 9 Episode 20 online via TV Fanatic with over 5 options to watch the Modern Family S9E20 full episode. Affiliates with free and paid streaming include Amazon, iTunes, Vudu, Hulu Plus, and Verizon On Demand. On Modern Family Season 9 Episode 20, Mitch and Cam realize Dede's effect on their lives, and Phil, Luke, Alex and Haley all have bad news to break to Claire. There's a box out here marked fruit of the month. I'm assuming that means one of you won a contest. Her therapy dog got the flu, so I get to ride first class. Well, on her lap. Permalink: Her therapy dog got the flu, so I get to ride first class. Well, on her lap. Modern Family Season 9 Episode 20 Review: Mother!